Cowboys. And. Aliens. No, this isn't another poorly made knock off from the Asylum studio but the Jon Favreau-directed blockbuster starring Harrison Ford, Sam Rockwell and Daniel Craig, and a bunch of big-name executive producers including Steven Spielberg and Ron Howard. Unfortunately, somewhere along the line though, all the fun seeped out of this ridiculous concept. The film begins with Daniel Craig's character Jake Lonergan recovering consciousness in the middle of nowhere, with a spot of amnesia and this weird metallic bracelet on. He effortlessly dispatches a trio of baddies before rolling on in to the nearest town, where he witnesses spoilt brat Paul Dano bullying the townspeople. Lonergan humiliates Dano's character Percy, who threatens retribution from his father, Harrison Ford's Colonel Dolarhyde. Lonergan soon learns he is a wanted outlaw and finds himself in the hands of the local Sheriff, mostly thanks to Olivia Wilde, whose Ella is equally as mysterious as Lonergan. Soon after, the aliens attack, abducting many of the townspeople and we discover the impressive power of Lonergan's metallic bracelet weapon. A select gang then head off to try to rescue the abducted from their alien captives. There's not much characterisation in 'Cowboys & Aliens' - our emotional investment supposedly being driven almost solely by the fact that the creepy alien beings have abducted our fellow humans. It's equally difficult to get behind the gang of would-be human saviours, who are barely likeable or sympathetic. Indeed, the one moment of empathy for the human cause comes late on in a surprisingly well-done trilingual scene. There are a handful of thrills and impressive effects, with the early abduction scene when the aliens raid the town being a particular highlight, but they merely further demonstrate how much the final product could have been - if we were allowed to have more compelling characters. Without being terrible, 'Cowboys & Aliens' is sadly quite disappointing and forgettable. 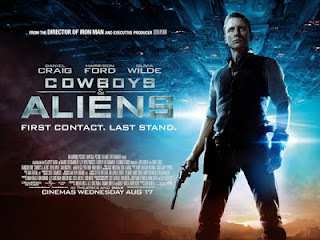 'Cowboys & Aliens' is on wide release throughout UK cinemas now.